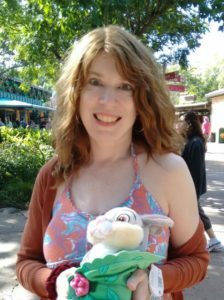 The very first time we went to Disney World as a family, I debated whether we should spring for an autograph book. After all, if you think about it (although I usually try not to), it’s really just an employee in a suit who has worked really hard to perfect copying a signature. Do we really need that? Well, “need” is a strong word, but the thing is, you really do want something tangible for when you meet and interact with the characters. Plus kids tend to love something that’s theirs to hold onto during the vacation and to keep track of how many characters they met so far, and who they have left to meet. So yeah, it’s worth the money (or effort, if you want to make one), in my opinion. I’d love to tell you that when my kids were little, we all sat around the kitchen lovingly crafting our own handmade Disney autograph books that I personally designed myself and that were unique and beautiful. But nope. I’m just not that kind of mom (generally speaking). We simply bought the albums when we were in the park. (Which, now that I’m thinking about it, was partly because I was torn over whether we “needed” them or not until we were actually there). Click here to see the Official Walt Disney autograph book you can get at the parks. 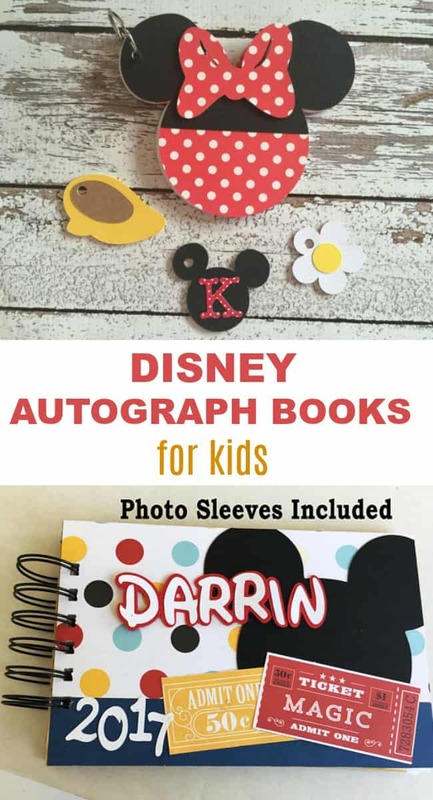 If you want something prettier and more interesting than what we did, but for whatever reason don’t want to make your own, there are some really great personalized Disney autograph books on Etsy. 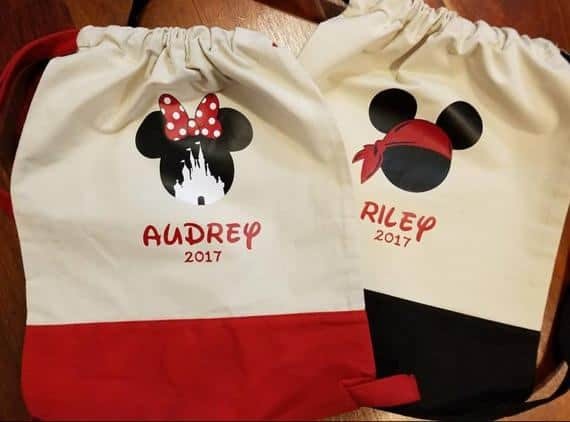 Yes, it costs more money than what you would pay for an autograph book at the Disney Parks, but children love having something with their name on it (as do adults), and there are so many options that it’s easy to find one that best fits what you want. This pen is great for getting autographs because the characters don’t have to fumble with a cap. 6.0.1 Get a FREE Disney rides checklist! Click the image to see it on Etsy! This album is so pretty — and what little girl wouldn’t love a Disney autograph with their name in gold glitter on the cover? The book cover is made from sturdy chipboard and is bound with a twin loop wire binding. The finished book measures 7 by 6 inches, which includes the binding. The book in available in these three different options. And the seller, Jessica at Fairytale Trading Post, has fantastic customer service. She includes not only a personalized note with each book, but also a Sharpie marker! If you know a Minnie Mouse fan (like we have at our house), then this book is sure to be a hit. 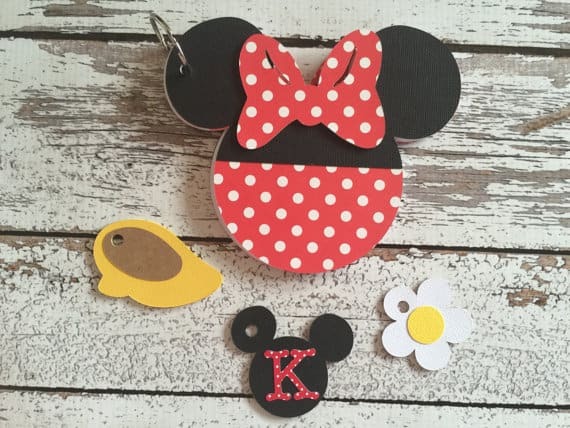 It’s in the shape of Minnie ears and comes with three charms, including one that can be personalized with any initial you like. It comes with ten pages, but you can pay a little extra to have additional pages put it if you like. 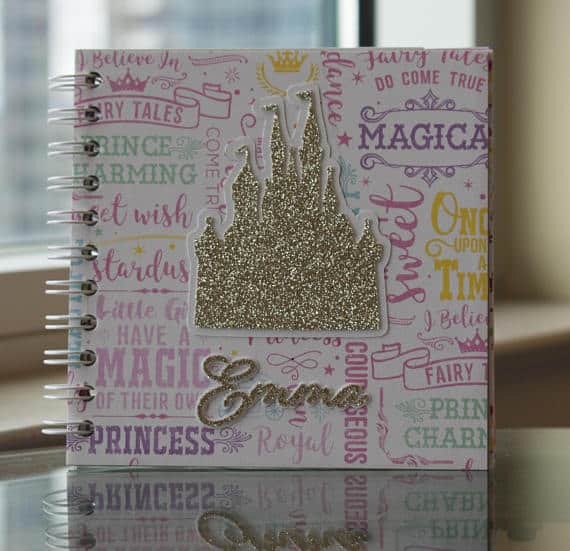 The Etsy seller, Cinderella rags, also makes similar autograph albums with charms in the shapes of Cinderella, Goofy, and Woody from Toy Story. This cinch tote is for people who like to be both practical and a little different. Instead of having to worry about holding onto a book, worrying about not losing it, taking it in and out of your bag … why not just have your bag be the autograph album? The tote bag can be personalized with both your child’s name and the year and comes in six different design choices. The Etsy seller, GraphX Vinyl and More, also makes several Disney tees, including matching ones for couples. This is the perfect book for the young Disney traveler who will grow up to be a blogger someday. I would have loved this book when I was a kid. 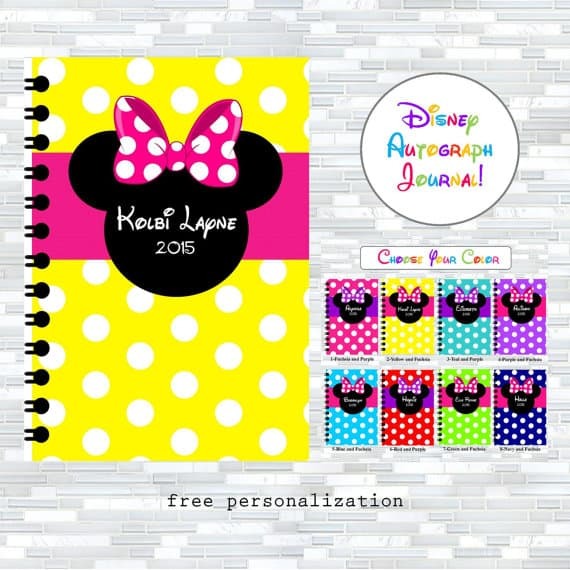 Instead of just being a collection of pages to collect autographs in, it’s larger than your typical autograph album and also has the option to also include lined pages with journal prompts and coloring pages with Disney characters. Doncha hate it when you’re trying to write in a notebook and the front cover keeps bouncing back against your hand? That’s why I like this book — it’s spiral-bound, so you won’t have that problem! Also, the back cover is made of chipboard to give it a firm writing service. Double bonus! 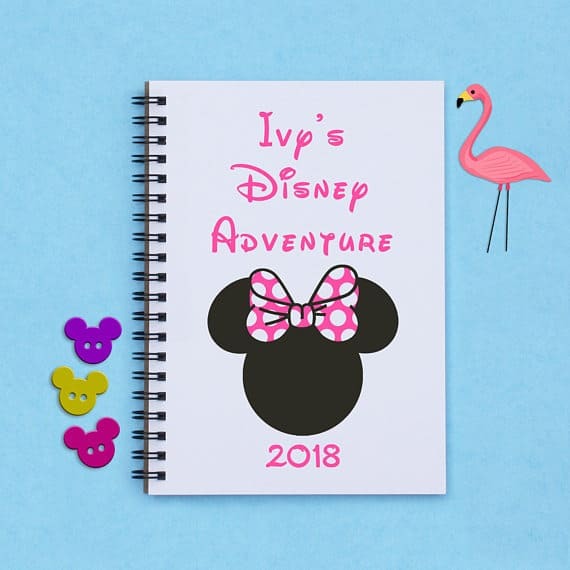 I like this particular design because I like Minnie Mouse and the color pink, but Etsy seller Flamingo Road Journals makes these in a ton of different cover designs, including one specifically for Disney honeymoons and another for Animal Kingdom. I realized I’ve been choosing a lot of “girl” albums, so to even things out, here’s one that would work for boys (or girls). What I like about this Mickey autograph book is that is comes with photo sleeves. We used this type of book on one of our trips, and it’s nice to see easily see when you met the character alongside their autograph. This is another book with one of those great spiral bindings, and you can customize it different ways to get the type and amount of pages that you want. The Etsy seller, Sippin Sweet Tea, has over 200 different Disney autograph albums, including ones specifically for Disney cruises. In addition, she has over 100 different Disney shirts. 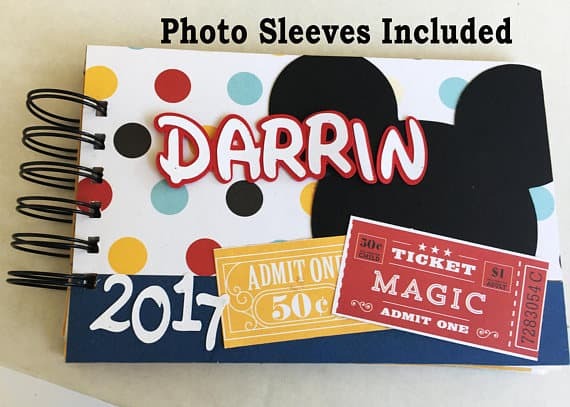 So, as you can see, there are lots of great choices for getting a beautiful, well-made, personalized autograph album for your kids’ trip to Disney World. Get the printable checklist Magic Kingdom Rides for Kids Under 48 Inches Tall when you subscribe. This is a fab range of autograph books! They’re all so lovely! I’ve still got my autograph book from when I went to Disney World in 1993! An autograph book is definitely a must when you’re a kid! There is so much cute stuff on Etsy, isn’t there Bec! 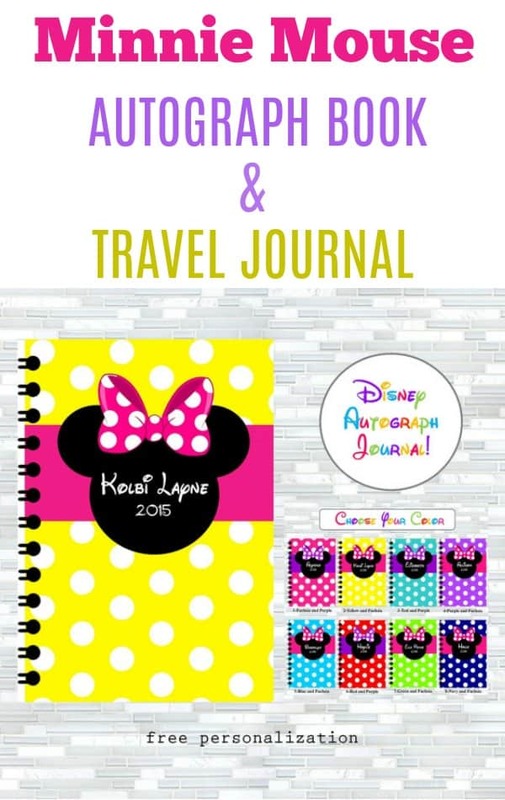 I need to do another Etsy Disney product post … maybe vacation planning printables?